The No Stitch Eye Lift + Bright Eyes is a non-surgical alternative that uses fractional laser technology to improve wrinkles around the eyes, tighten eyelid skin, improve skin texture and elevate the brows. 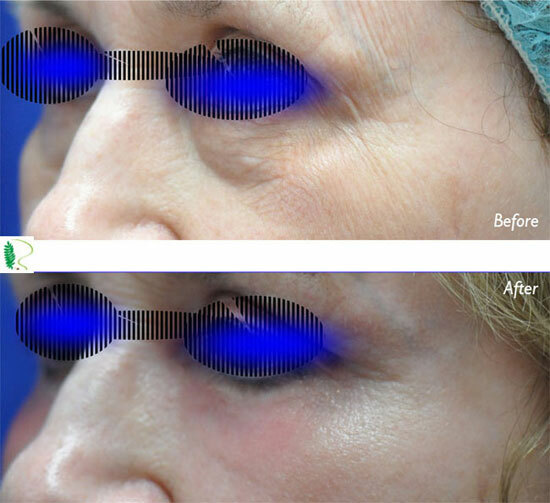 It improves drooping skin of the upper eyelids and can help you avoid eyelid surgery (blepharoplasy). Plus, it improves the dark rings and circles under the eyes. We all know that dark rings under the eyes and loose, drooping skin in the eyelids compromise facial appearance, making you seem tired when you actually are full of energy. No more "Didn't you get enough sleep?" comments. The No Stitch Eye Lift + Bright Eyes will bring out the beauty of a more youthful eyes. The ‘no-touch’ concept is rooted in avoiding any direct needle injection into the red portion of the lips. This prevents distorting the lip anatomy. Swelling and bruising are also decreased during and after the procedure. This gives Dr Cynthia Lopez the ability to take her time and carefully analyze lip aesthetics, as she proceeds with her injections. 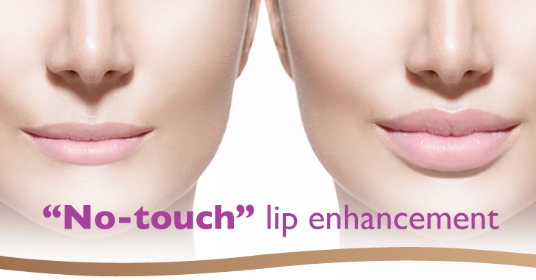 The second key component of the ‘no-touch’ concept is to approach lip enhacement with an anatomically based rationale. By treating the lips based on anatomic sub-units, Dr Lopez can customize each person's lip profile, projection and augmentation that will appear natural and beautiful. A. “Profile,” focuses on defining or sharpening the white roll, philtral columns and cupid's bow. C. “Augmentation” enhances the height of the lips through wet vermillion volumization. The third and optional component of the ‘no-touch’ concept is relaxing the muscles that pull down the corners of the mouth, by injecting Botox into the Depressor Anguli Oris (DAO). This creates a perkier lip corners. It also slows down the deepening of the lip corners that give way in older life, to unpleasing puppet mouth look. Be the first to try this newest approach to smooth and luminous skin. The NanoLaserPeel from Sciton provides an alternative solution to microdermabrasion and chemical peels. But the NanoLaserPeel can do much more. It uses light energy to instantly remove the top layers of the skin at a depth that also accelerates the skin's own renewal process by activating special messenger proteins. Microdermabrasion and chemical peels often don't get deep enough and other lasers leave a layer of heat-damaged cells that interrupt the ability of these messenger cells to communicate with deep layers of skin. Only the NanoLaserPeel from Sciton has the precision to work at just the right depth, creating beautifully smooth, firm, luminous skin… even after one treatment. Patients typically show up on a Friday for treatment, recover on a weekend, then show-off on a Monday. People will notice their dewy fresh, smooth, glowing, luminous skin without looking overdone. The procedure takes about 1 hour from the application of a numbing cream to the end of the procedure. Another 20 minutes of skin cool-down period follows. • Helps prevent and address early signs of aging. • Improve overall skin texture and elasticity. • Reduce the appearance of pores. Be the first to try this newest approach to smooth and spotless skin. The FotoBBL from Sciton uses a gentle yellow light that will lift and flake the brown spots away. Next, the NanoLaserPeel will remove the top layers of the skin at a depth that also accelerates the skin's own renewal process by activating special messenger proteins. Microdermabrasion and chemical peels often don't get deep enough and other lasers leave a layer of heat-damaged cells that interrupt the ability of these messenger cells to communicate with deep layers of skin. Together, Sciton's FotoBBL and NanoLaserPeel synergistically work to improve the skin from top to bottom and from bottom up creating a healthier, beautifully smooth, firm, brighter skin… even after one treatment. Patients typically show up on a Friday for treatment, recover on a weekend, then show-off on a Monday. The deeper brown spots may take longer to peel off but are not a reason to miss work. People will notice their dewy fresh, smooth, glowing, luminous skin without looking overdone. The procedure takes about 2 hours from the application of a numbing cream to the end of the procedure. Another 20 minutes of skin cool-down period follows. The Vampire PRP is most commonly known as the "Vampire Facelift" - a term trademarked by Alabama cosmetic surgeon Charles Runnels, to market a procedure that uses a patient's own Platelet-Rich Plasma (PRP) for the cosmetic treatment of wrinkles or scars in the face, hands, and neck. It is less invasive than plastic surgery, takes about 30 minutes for each treatment, and offers improvements for up to 18 months. Stem cells are at the core of the tissue regeneration process. Without them, PRP may not be able to unleash it's full potential. PRP is a biologic isolated from whole blood that is preferentially enriched for platelets. While platelets are the primary component of PRP, preparations may also contain other cellular components such as white blood cells (WBCs) and peripheral stem cells. These components all play a biological role in the healing process and are provided at concentrated levels in PRP. 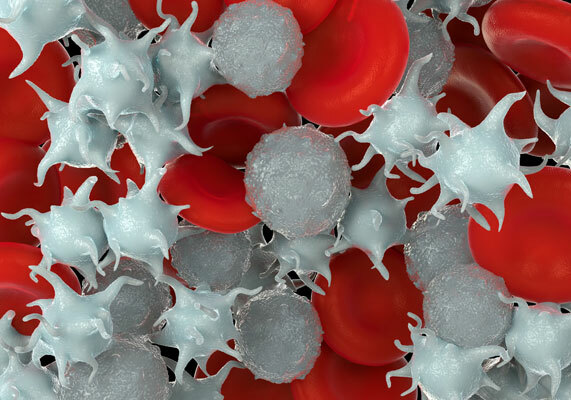 Platelets play a critical role in several aspects of the healing process. Activated platelets release adhesion molecules that support clot formation for hemostasis. They also release several antimicrobial peptides that deliver infection control properties. Most importantly, as it relates to healing, platelets also release numerous growth factors, that have been shown to orchestrate the key biological processes, including new blood formation, inflammation resolution and tissue regeneration. WBCs (or leukocytes) play a key role in protecting the body from infection. Stem cells are at the core of the tissue regeneration process. They are required to rebuild and repair damaged tissue at an injury site. Platelets release several growth factors that function to induce migration of stem cells to the damaged tissue during the healing process. PRP provides these growth factors in high concentrations. In addition, some PRP preparations also contain stem cells isolated directly from the blood sample during processing, which can directly support tissue regeneration. What is the rationale behind the use of PRP therapy to improve facial appearance? A steady trend over the past 15 years has been for patients to seek less-invasive procedures for facial rejuvenation. PRP has been used by surgeons over the past several years to speed up soft- tissue healing from sports injuries as well as to treat burn victims and patients with severe ulcers. It is also used as an adjunct to implant therapy in dentistry. The concept behind the clinical use of PRP is to harness the natural biological components of a patient's blood -primarily platelets to be used cosmetically to treat volume loss in the face, hands, and neck -- particularly the crepey skin under the eyes and neck -- as well as wrinkles, acne scarring, and stretch marks. Platelets play a role in stopping bleeding and in repairing damaged blood vessels and cells in the body. Platelets also contain substances called "growth factors" that activate stem cells and rejuvenate cells in our body. Unlike fillers that use various synthetic substances, PRP is the patient's natural substance to address skin defects and volume loss, triggering production of new cells and collagen formation. This cutting-edge rejuvenation is a quick 30-minute procedure. After 30 cc or 60 cc of blood (2 tbsps or 4 tbsps) is drawn from the patient, it is spun down in a centrifuge for 14 minutes at a pre- calculated speed to retrieve the most viable part of whole blood - the PRP. After centrifugation, PRP is extracted and re-injected into the area of concern. Because this filler is made from the patient's own blood, there is no risk for rejection, infection, or an allergic reaction. Any patient who wishes to reduce volume loss, fine lines, and textural changes of the skin is suitable for this procedure. It also appeals to the patient who is looking for a natural approach to volumizing the face and treating or reducing fine lines. PRP treatment can be repeated, and better results are seen with a total of 3 treatments given 3 months apart. Patients can expect to see better results as they receive more treatments. With time, the results of PRP treatments get better and better. How does PRP therapy compare with injections of fillers or Botox? 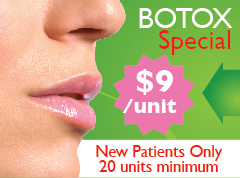 This procedure can be combined with dermal fillers, Botox injections, and laser surgery. PRP builds tissue over time, whereas traditional filler breaks down over time. If a patient has volume loss with a lot of fine lines and textural changes, I like to inject dermal fillers first then layer PRP on top to create a new foundation of collagen. Then I address fine lines and textural changes by one of the following methods, depending on patient's tolerance for downtime: fractional microneedling, fractional laser resurfacing, Nanolaser peel, Microlaser peel or medium depth full laser resurfacing. What is your overall opinion of the role that PRP therapy should play in facial restoration? PRP therapy is very promising in facial restoration. Results are optimal when patients receive a combination of PRP, dermal fillers, and laser therapy. A youthful face is a full face with beautiful continuous contours that start slightly wider at the top and softly narrows down towards the chin. A youthful face looks brighter and vibrant because light is fully reflected on a full face. As we get older, the beautiful continuous contours become broken and compartmentalized by the appearance of hollows in the temples, above the brows, under the eyes, under the cheeks, around the nose and around the chin. These hollows represent the loss of soft tissue mattress that used to support and prop up these areas. This loss of support leads to droopiness of the skin that collects and collapses at the jaw area. Now, the shape of the older face becomes wider at the base. To make matters worse, light becomes trapped in the hollows making the older face look haggard. Fillers, Plumpers & Volumizers replace the loss of soft tissue mattress, re-creating the fullness of youth. Fillers & Plumpers are gel-like cushiony substances that immediately replace loss of fullness. Plumping results are instant. Among them are Radiesse, Juvederm, Voluma, Restylane and Belotero. Volumizers such as Sculptra do not deliver instant results. They serve to build your own soft tissue mattress by creating brand new collagen over a period of time. As your own collagen builds up, the hollows are filled up and the droopiness is lifted up. Each Fillers, Plumpers & Volumizers has its advantages and disadvantages. Dr. Cynthia Lopez will help you decide what is best for your needs. 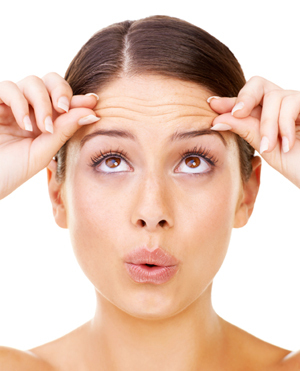 By weakening or paralyzing the muscles of facial expression, Botox works well with dynamic wrinkles. Dynamic wrinkles in the forehead, in between the brows and crows feet all respond very well to Botox. While no treatment for nail fungus is 100% guaranteed, the Sciton laser has produced successful results in 75-80% of cases in clinical studies. This is superior than any anti-fungal product applied on the nails. A major advantage of using the laser is that you are able to get the curing power of oral medication without any side effects. The Sciton nail fungus laser is safe, non-toxic and effective. Q: What causes nail fungus infection? A: Onychomycosis refers to a fungal infection that affects the toenails or the fingernails. It is caused by a dermatophyte - the type of fungus that usually infect the dead cells of the human's outer coat: nails, hair and top skin. The fungus has the ability to feed from these dead cells. fungus. Trichophyton rubrum is responsible for an estimated 90% of cases of onychomycosis, with Trichophyton mentagrophytes implicated most commonly in the remainder of cases. Despite the clear role of these 2 common dermatophyte fungi in the causation of onychomycosis, Candida yeasts and non-dermatophyte molds are also frequently involved. The clinical type of onychomycosis, along with the infection location (e.g., fingernails or toenails) often is aligned with specific causative organisms. Awareness of mixed infections with co-infecting organisms has increased in recent years. Reports of mixed infections from multiple causative organisms range widely from 3% to 21%. A recent study in 44 patients previously diagnosed with onychomycosis found that mixed infections were present in 41% of the participants. Effective treatment relies on proper identification of the causative organisms, and mixed infections require a carefully considered treatment approach. Q: How do you get onchomycosis? A: Onychomycosis of the toenails often occurs in individuals who have concurrent athlete's foot (tinea pedis) infections, making the presence of tinea pedis a clear risk factor. Walking barefoot in public places such as the gym or swimming pool is a well-established risk factor for this infection. People who perspire heavily or whose occupations or recreations expose them to humid, moist environments are also at increased risk. People who participate in activities that induce chronic minor trauma to the toes are at greater risk. Swimmers in particular are noted to be at increased risk. Q: Is testing needed before treatment? A: In practice, diagnosis is often made clinically, but this is not considered the ideal approach because of the potential for misdiagnosis and the need for targeted treatment, especially in cases with multiorganism involvement. Several signs of onychomycosis may present with other clinical conditions, and differential diagnosis is needed to ensure appropriate treatment. 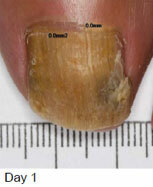 Onychomycosis can mimic many other clinical conditions that affect the nail, including trauma, bacterial infections, inflammatory processes (such as psoriasis), and even cancerous conditions. The use of nail polish and self-tanning products can lead to yellow discoloration of the nails, and natural physiologic changes due to aging can also cause yellowing. Certain systemic medications can also cause nail changes, including the use of tetracycline therapy and retinoids. In patients who are not immunocompromised, psoriasis and lichen planus would be the first considerations in the differential diagnosis. Although clinical examination is a necessary first step, laboratory confirmation is essential to confirm the diagnosis and direct treatment of onychomycosis. Fungal culture is a slow process but is the best widely available method for positively identifying the causative organism of onychomycosis. In cases of infections caused by yeasts or non-dermatophyte fungi or in mixed infections, fungal culture can be valuable in helping direct effective treatment. Culture may also be beneficial in assessing patient response to treatment. Q: How does the laser kill the fungus? A: All five FDA approved laser devices for onychomycosis treatment are 1064 neodymium doped Yttrium Aluminum Garnet (nmNd-YAG) laser. This laser delivers light beams into the affected nail to achieve fungicidal effects. Q: What does a laser treatment session consist of? A: A laser treatment session consists of applying beams of laser light passed several times on ten toes, toe webs, sides and under sides of both feet. This same process also applies to fungal infection of the finger nails. Regardless of the number of toe nails or finger nails affected, all ten toes or all ten finger nails will be treated. This is to ensure that any dormant fungus lying anywhere else on the foot or hand will be eliminated, so as not to cause re-infection. A treatment session takes about 15 - 20 minutes. The treatment requires no injections, bandages or medication. Q: Is there any pain during the laser treatment? A: In order for the treatment to be effective, enough heat should be delivered to kill the fungus. This may cause bearable discomfort but it should not be painful. Q: When can cure be ascertained? A: Knowing if the treatment works takes time. One cannot expect to see an immediate response. Treatment adherence is critical for treatment success. It is important to synchronize patient's expectations with the reality of treatment duration and how much time will be required to achieve a cure. In many patients, it can take months to see visible results. 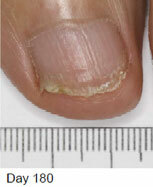 Nail growth rate has the greatest influence on how quickly results are evident from any onychomycosis therapy. In general, clearance of infection becomes evident as nails grow. Toe nails take an average of 12 months or longer to be fully replaced. Patients should expect to see visible results in accordance with that growth rate. Clinical cure is 100% clearance. 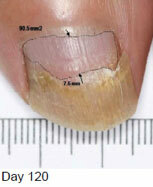 Big toe nail grows 1-2 mm/month. Average male toe nail is 22 mm. If 75% of the nail is involved, it can take 6-12 months to grow out. If only 20% of nail is involved, it can take 5 months to grow out. Mycological cure means negative fungal culture confirms the eradication of the fungus. Q: How long after laser treatment may I return to normal activities? A: You may return to normal activities immediately following your treatment. There is no lingering discomfort or down time. Q: Can the fungus come back even after a successful treatment? A: Onychomycosis is difficult to permanently eradicate. Even after achieving mycological cure, relapse/re-infection rates are estimated to range from 16% to 25%. Many factors contribute to onychomycosis recurrence. It is important to note that it is often difficult to distinguish between "relapse" and "recurrence." Some patients with higher risk for onychomycosis owing to difficult-tomanage factors such as genetic predisposition or immunodeficiency are very likely to relapse. Add this image. I will send it via gmail. Risks for recurrence are largely the same as for primary infection. For most patients, the controllable factors that minimize risk of primary and recurring infections involve personal hygiene, nail care habits, and lifestyle factors. Patients should keep their feet clean and dry, trim nails carefully, and use antifungal sprays or powders in their shoes to help prevent infection. Patients attempting to prevent re-infection should consider throwing away older shoes, particularly older athletic shoes. Shoes that are not disposed of should be sterilized. It is prudent for patients to avoid walking barefoot in public areas. Household transmission is common, and patient education and family screening to evaluate risk factors and the presence of existing athlete's foot can help thwart this transmission route. Household laundry practices are an important component of prevention and the avoidance of transmission. One study measured dermatophyte transmission during a simulation of normal household laundry conditions and found that storage of dirty clothes in a laundry basket resulted in 10% of infectious organisms being transferred from infected clothes to non-infected clothes in the basket. Further study of subsequent washing temperatures found that Candida albicans can be easily inactivated in most normal washing procedures; however, T rubrum required a washing temperature of at least 60 degrees centigrade (C) for inactivation. Careful attention to household laundry methods can greatly aid in the prevention and spread of infection. If you do not want a laboratory diagnosis for whatever reason, and wish to go ahead with the laser treatment during your first appointment, then we will perform the laser treatment. *Please bring a pair of open toe slippers or flip flops when you come in for treatment.